The Aqua Fresh WF295 filter improves taste and purity of water for drinking as well as improving the quality and clarity of ice. This filter is a high quality, competitive alternative to the factory original. It features easy installation and operation and helps reduce chlorine taste and odor. if you are looking to reduce contaminants found in tap water and improves its quality, look no further! Made from renewable carbon media. Filter screws into refrigerator. 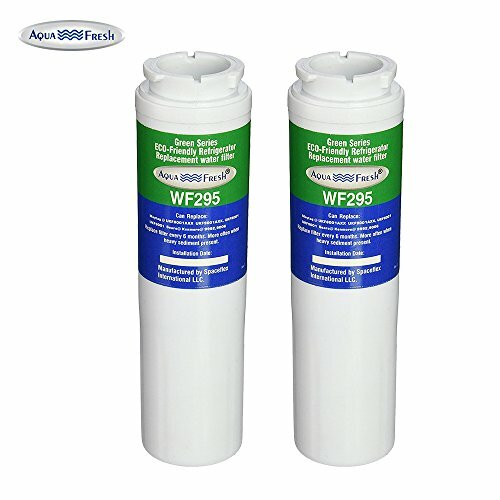 The Aqua Fresh WF295 is compatible with the Maytag UKF-8001 and UKF8001P.  EASY TO FIT: Designed to fit the original with Twist and lock Design. No tools required.  AFFORDABLE OPTION: Costs less than OEM filters without compromising any quality or flow rate.  CERTIFIED QUALITY: All Aquafresh Filters are tested and certified by IAPMO to NSF Standard 42 for Structural Integrity, Materials Safety, Chlorine taste, odor reduction and System performance. Quality you can taste!  FITS: Amana OWF50, OWF51, Sears/Kenmore 46-9005, Maytag UKF8001, 8001P, Whirlpool EDR4RXD1, KitchenAid 4396395, 8171032, Viking RWFFR (See product description below for complete list of compatible models).